Getting the multidome performance space to L.A. involved incredible amounts of documents, cryptic messages and secret handshakes, but eventually we spotted the 5 bags on the cargo trucks next to our airplane at Schiphol along with some 17 horses, which travelled about 5 seats behind us. Sphaerae was given a prime location in Pasadena at the towns most famous corner on a well watered lawn, where it was set up in the blazing California sun. The much anticipated air-conditioning system turned out to be about the size of a truck and could keep the structure inflated even just by itself. From the first moments of it's full inflation the structure ignited great enthusiasm with everyone except perhaps the officials of the fire department. Soon this work by 'the Dutch architect' featured in both major and minor newspapers. Robert Crouch had set up an ambitious program of experimental works with artists prepared to collaborate and explore unknown territory with peers and audiences. 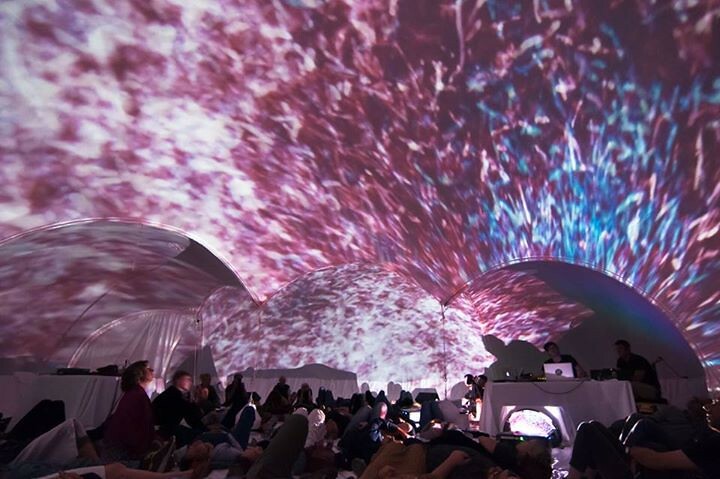 We had an amazing tech set-up with crisp audio and full-dome projections, so the space was more immersive than ever. During the three weeks AxS saw some amazing performers and some people even slipped past the security guards at night to record performances of their own, which emerged on social media. Evelina Domnitch and Dmitry Gelfand who form part of the Sphaerae team presented next to their own performance '10000 Peacock Feathers in Foaming Acid' also an overview of earlier works made for Sphaerae. In all we feel this is the start of many new friendships and collaborations.